Some people are late bloomers. I guess I could be considered one, or I am just working my way backwards. After raising my family, getting a house, a car and all those “things” we work so hard for, I discovered my next great passion, mountain biking!!!! It all started 9 years ago when I finally gave up cigarettes, saved money for two weeks (seriously) and bought my first bike. Who would have ever known that that passion would have grown into what it is today. Living in Phoenix, Arizona gives me the best of all worlds and the opportunity to mountain bike all year long! When it gets too hot in Phoenix, we have Prescott an hour away, Sedona an hour and a half away and let’s not forget Flagstaff, Arizona. If I go a week without getting on my bike, someone needs to call and check on me. One of my greatest joys is taking a woman on her very first trail ride, watching her face and helping her through her fears and apprehensions. The confidence she experiences and the empowerment of doing something that only she can do for herself is contagious and oh so very rewarding! 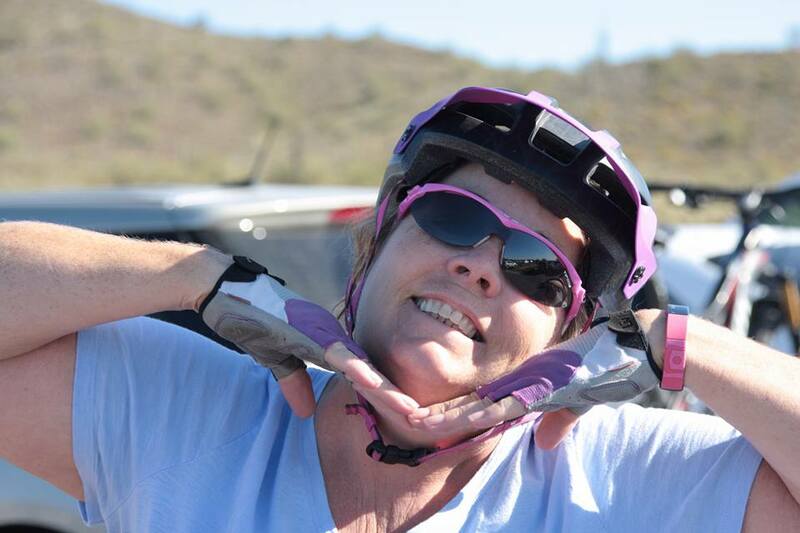 If you are in the Phoenix area and you want to experience a true “no drop” mountain bike ride, you can look me up on Facebook on the North Phoenix Dirt Ladies page. We schedule regular group rides that accommodate every level of rider and we would love to have you! So, what do I do when I am not out on the trails…….mmmmmm…….well, you can find me hanging out with friends or painting my next great portrait at home. OOOOOOOH…let’s not forget about trying to talk my daughter into letting me take my four beautiful granddaughters out on the trail.